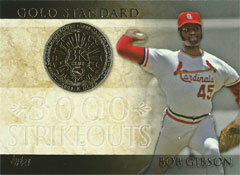 Bob Gibson once squandered a 6-0 first-inning lead and was lifted before he could get three outs. Lance Lynn can take solace in knowing even the greatest Cardinals pitcher could waste such early run support. That was just the second time in franchise history that the Cardinals were involved in a game with the score tied 6-6 after two innings, according to the Elias Sports Bureau. The first occurred in one of the most ineffective starts in Gibson’s distinguished big-league career. The night of April 16, 1962, was cold and windy at Philadelphia. The game time temperature was 36 degrees. Only 3,895 came to see the Cardinals play the Phillies at Connie Mack Stadium that Monday night. St. Louis had won its first three games. “We’ve been going good in bad weather,” Cardinals manager Johnny Keane told the Associated Press. Gibson was making his first start of the season. He was opposed by Cal McLish, making his first appearance for the Phillies after being acquired from the White Sox. The first five Cardinals batters reached base, four on walks from McLish. The fourth walk was issued to Ken Boyer with the bases loaded. Bill White produced a run-scoring double and Doug Clemens hit a three-run double before McLish was replaced by Dallas Green. Gibson singled, driving in the sixth run of the inning. Now, here he was in the same ballpark, facing, essentially, the same team _ but the results, this time, were much different. The leadoff batter, Tony Taylor, walked and advanced to second on a wild pitch. Johnny Callison walked. After Tony Gonzalez struck out and Wes Covington flied out, it appeared Gibson had steadied and would escape trouble, but Billy Klaus singled, scoring Taylor. Frank Torre walked, loading the bases. Clay Dalrymple knocked in two more with a single, cutting the Cardinals’ lead to 6-3. After a walk to Ruben Amaro loaded the bases, Keane replaced Gibson with Ernie Broglio. Roy Sievers, batting for Green, walked, scoring Torre with the Phillies’ fourth run. Taylor singled, driving in two and tying the score at 6-6. All six runs were charged to Gibson. When, finally, Callison made the third out, on a pop-up to the catcher, it ended a first inning that included nine walks and took 54 shivering minutes to play. Gibson’s pitching line: 0.2 innings, 2 hits, 6 runs, 4 walks, 1 strikeout. The Phillies wouldn’t score again that night. Broglio pitched 8.1 innings in relief and scattered five hits and four walks. In the third, Cardinals catcher Gene Oliver broke the 6-6 tie with a home run off Don Ferrarese (who, two weeks later, would be traded to St. Louis). In his next start, April 22 at Chicago, Gibson gave up four runs in eight innings and took the loss in a 5-1 Chicago victory, but limited the Cubs to four hits and struck out nine. Boxscore He finished the 1962 season with a 15-13 record and 2.85 ERA.